Sutton-Seifrit, Patricia A. 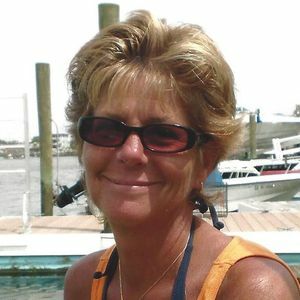 "Patty"- 59, of Dennis Township, NJ passed away January 16, 2019 in the comfort of her own home surrounded by loved ones after her courageous battle with ALS. She was born in Philadelphia to John "Jack" and the late June Gallagher. Patty lived in Cape May County her entire adult life where worked as the Tax Assessor for Dennis Township for the last 28 years. She loved the beach and could always be found around 29th Street in Sea Isle accompanied by her closest friends. She also loved the outdoors and never hesitated to try to embark on a new adventure or challenge. Patty enjoyed everything from camping to crabbing to sitting around her tiki bar and being surrounded by the ones she loved at a backyard BBQ and campfire. This terrible disease did not slow her down. She did not let it define who she was. She was determined to get out, be active, and most importantly stay positive. When things took a turn for the worse, she always had her Friday night happy hour with all of Patty's Peeps to look forward too and boost her spirit. Patty is survived by her loving husband, Donald Seifrit; her children: Brooke (Colin) Lally and Robert Sutton IV "Bobby"; her father John "Jack" (Janet) Gallagher; stepchildren: Donald Jr. and Tyler Seifrit; and brothers: James (Lynda) Gallagher and David (Michell) Gallagher; as well as numerous cousins and nephews Along with her mother she was predeceased by her brothers, Joseph and John Gallagher. Funeral services will be held Tuesday, January 22, 2019 at Radzieta Funeral Home, 9 Hand Ave., Cape May Court House, NJ 08210. The viewing will be from 9-11:15 a.m. and service will start at 11:30 a.m. Interment is private. Donations may be made in Patty's name to the Greater Philadelphia ALS Association, 321 Norristown Road #260, Ambler, PA 19002. To Patty's family my heartfelt sympathy and prayers. I worked with Patty at DT and she was one of the sweetest people I ever worked with. She will truly be missed. Saddened to hear of Patty's passing. Such a fun and happy soul she was. Bobby and Brooke you are in my thoughts and prayers. I wish you peaceful healing and many wonderful memories of the time you had with your mom. So sorry for your loss Bobby,If you need anything, just let us know. Patty was always upbeat and positive in her life.I.feel so Blessed to have known her. She was a very special client in our salon and loved by all..praying for Peace and Comfort for her Family....Patty will be missed but not forgotten..